Best Week 2014, Day Two! | SPACE-BIFF! ← Best Week 2014, Day One! Greys, Space Marines, and Xenomorphs! Which is absolutely true. Theseus is just mancala. Mancala aboard a space station, with upgrading pieces and special structures and the possibility of being jettisoned into space, and with highly individual factions battling for control — like the space marines, who spend their free time shooting stuff, or xenomorph-style aliens who lay ambushes and have a thing for tentacles, or scientists who set up lots of camcorders and cross their fingers that everyone else will be creeped out by their voyeurism and just leave the station peaceably. I know it’s one of the seven hundred heresies of the Board Game Cult of Pedants to list a lowly expansion as one of my favorite games of the year, but this was such a no-brainer that I had no choice. Also, I hate your cult and all its unnecessarily nitpicky terminology, so stuff off. We looked at two expansions for Darkest Night this year, and while both were good, it was From the Abyss that squeezed fresh air into the Necromancer’s long-dormant lungs, massaging breath back through the crusted bronchi and shuddering the pleura back to life, and finally sending a sputtered plume of dust from his blackened lips. It was… beautiful. Like a newborn baby, provided that baby was scary as hell. Less adorable were all the new tricks the Necromancer had learned since last the heroes defeated him. Like his enemies, he can now gain persistent bonuses, and each and every one of them make Darkest Night’s cooperative gameplay nigh-impossible all over again. 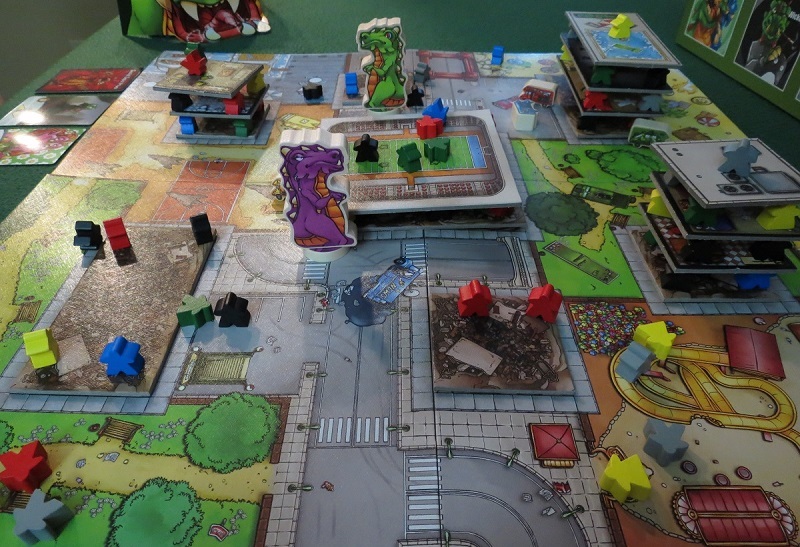 The only thing that makes less sense than Rampage’s horrible rebranding — Meeple City? Are you kidding me? — is its original title, which was simply begging for a lawsuit from the owners of the video game Rampage. The video game was (coincidentally) about dueling monsters who demolish a city in the process of their punching and fire-breathing. 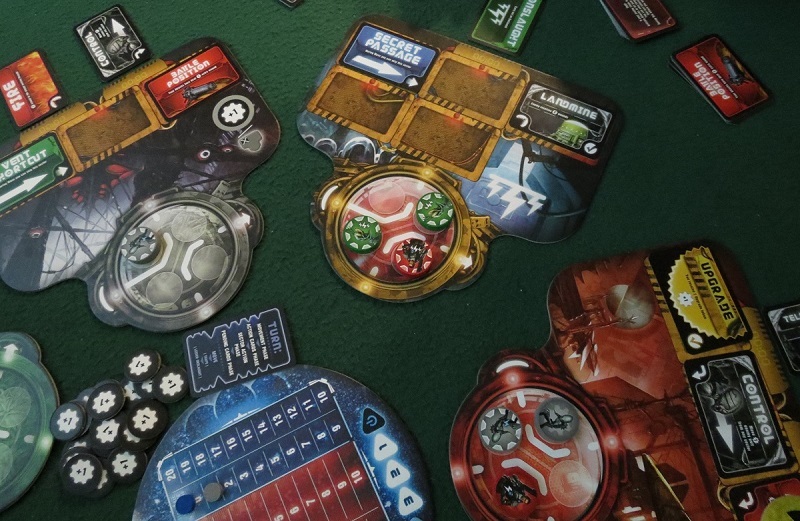 The board-game-formerly-known-as-Rampage is a completely different ball of kaiju wax. It’s about dueling monsters who demolish a city in the process of their punching and fire-breathing. All that aside, the cool thing about the board game version of Rampage is that it’s one of the niftiest dexterity games you’ll ever play. When it’s time to move your monster, you flick his feet across the board. When you attack a building, you pick him up and drop him on top of it, sending structural bits and crunchy morsels flying out. When you breathe fire, you apply your chin to the monster’s head and blow as hard as you can, sending droplets of influenza-bearing spittle across the board and winning the game by default when nobody else wants to play with you. Protip: play when you’ve got flu and breathe fire every turn. I guarantee your pansy friends will forfeit. I’m always on the lookout for small games. It isn’t that I travel a lot, or have any need to bundle lots of games into a tight space. For whatever reason, I just like having the option. 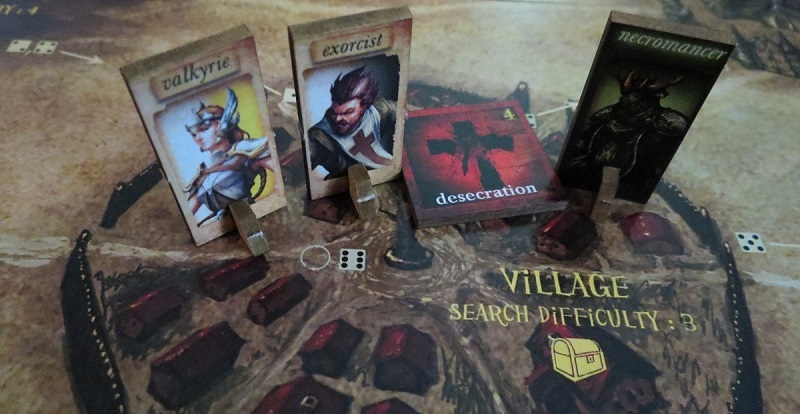 Also, smaller games tend to be quicker, and my group of friends spends so much time debating which big evening-defining game we’ll play that we end up with lots of time left over for quick games like Tiny Epic Kingdoms. TEK, as the cool kids have apparently abbreviated it, is indeed tiny, though it boasts surprisingly strong replay value thanks to a whole bunch of unique races with various powers. One game might see you playing as the Dwarves and building a tower for lots of points, while another will see you abusing your allies as the Halflings, and another as the ever-expanding Undead. There’s a lot to do and not much space required, giving this one of the highest game per cubic inch ratios of the year. This is how they did tableau-building in the old days. Another day of Best Week, another worker placement game. It’s the sort of thing that might elicit a world-weary sigh. Might. Because not only is The Ancient World beautifully illustrated by Ryan Laukat, it’s designed by him too, so there are plenty of Laukian twists keeping the proceedings fresh (“Laukian” is a real word. I promise, so don’t bother looking it up). For one thing, your workers come with different skill levels, and it’s possible to block access to a particular site by using a highly skilled worker early on. Even more interesting is the way your titan-slaying soldiers become more and more expensive until you retire them, handing some of their experience over to the next batch of soldiers and resetting their cost. The result is one of Laukat’s slimmer designs, somewhere between Eight-Minute Empire and City of Iron, and easily one of his best. Yesterday we featured an entry on Space-Biff! crewman Elliott’s list of “Hidden Information Games of 2014,” and next on that list is Lords of Xidit. This colorful game sees your wandering idrakys concealing not only the warriors he plans on sending to their deaths to purge the land of monsters, but also the programmed plans themselves. Possibly because he’s naturally suspicious, though in this case he’s surrounded by other idrakys who would happily steal fresh recruits and kills before he even arrives at any given beleaguered city, so who can blame him? Based on the older Himalaya (2002 counts as “older” in board game years), this one is clever from start to finish, and unless you’re similarly clever your idrakys is going to spend a lot of time wandering from city to city, doing nothing of particular import while your rivals hire powerful mages and kill big scary monsters without you. It is, in a word, fiendish. In spite of its adorable appearance. Don’t panic — Best Week 2014 continues tomorrow! Posted on December 30, 2014, in Board Game, Lists and tagged Best Week!, Board Games, Space-Biff!. Bookmark the permalink. 3 Comments. #23: From the Abyss: Excellent expansion, just as good as With An Inner Light, I think. #22: Rampage: Didn’t play it, though I should have. Dexterity games are so fun. 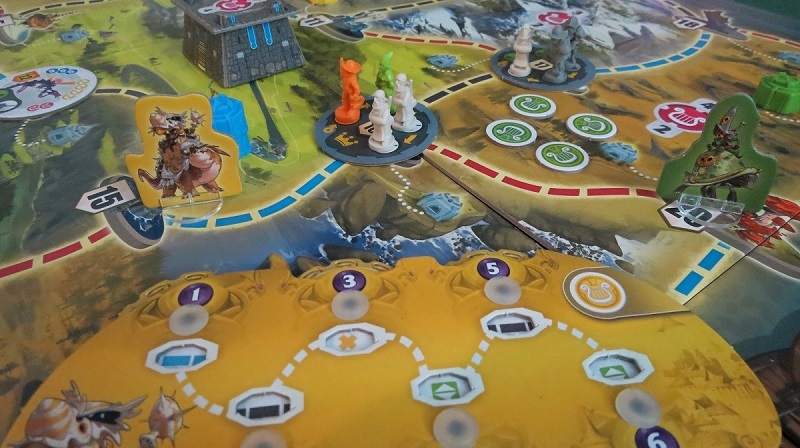 #21: Tiny Epic Kingdoms: Good, though I think it’s overrated. I’ve become quite jaded with Kickstarter this year, and I think TEK is basically “Kickstarter-good,” which means it’s good for a KS product but compared to everything else out there it’s merely okay. And the whole “vote for us on BGG for perks” type behavior really inflates those ratings. #20: The Ancients: Didn’t play it yet — YET. But I love 8ME, so I’ll be giving it a try just as soon as someone I know gets their KS copy. #19: Lords of Xidit: Played half a game at my local store and thought it was boring. I should give it another shot (I was in a mood that day), but it hasn’t come out again. Just now catching up thanks to the holidays. Of the games featured here, the main ones that stand out are Theseus, which might be my GotY, Tiny Epic Kingdoms as one of the better fillers of the year, and Lords of Xidit, which I’ve also really enjoyed. Still need to try The Ancient World, kicking myself for not backing it.